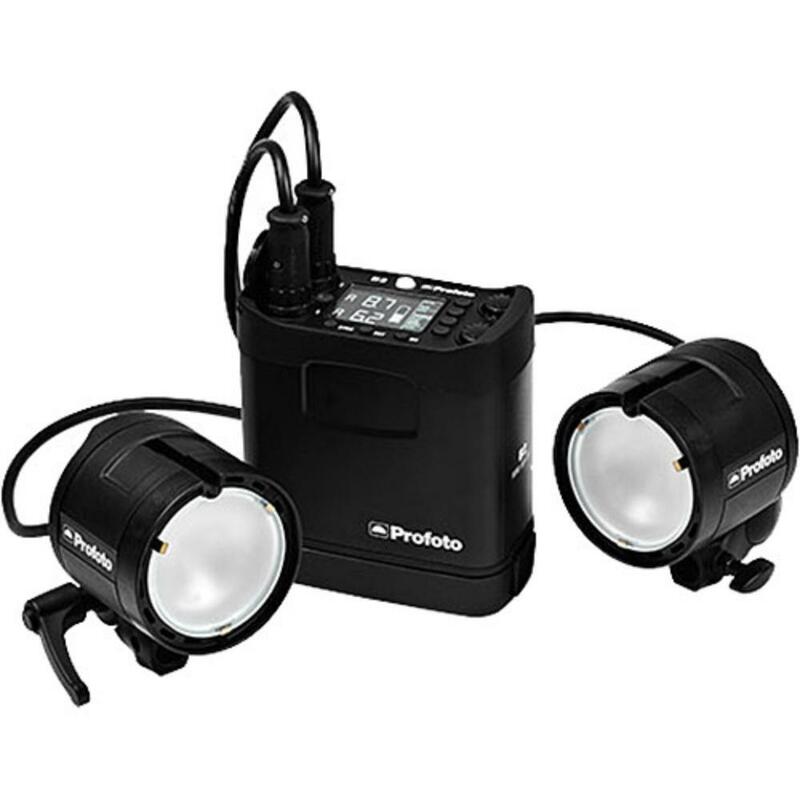 The Profoto B2 250W/s AirTTL Location Kit features 250W/s of flash power distributed asymmetrically over a 9-stop range in full or 1/10 steps across the two heads. This kit's batteries can be charged in or out of the pack and give you up to 215 full power flashes on a 45-60 minute charge. Shooting bursts of up to 20 FPS can be achieved with this kit in High Speed Sync mode allowing for shutter speeds up to 1/4000th-1/8000th of a second. There is an umbrella shaft slot in each of the heads as well as a stand mount and ratcheting handle that can be removed for adding your own flash bracket onto one of the heads for on-camera mounting. These heads are compatible with Profoto's light modifiers up to 5' in the octagonal shape and up to 4' for the rectangular shape softboxes. These heads can also accommodate Profoto speedrings. Each head is fixed to a 6.5' cable that connects to the pack. An extension cable can be rented separately. This is a fully portable kit that is perfect for on-location shooting where AC power isn't readily available. Its wide range of power settings makes this kit suitable for studio and outdoor shooting and is perfect for portraits, action shots, lifestyle photography, and event shooting. • Use the included 1/8th-PC sync cable to fire this flash from your camera. Alternatively, you may rent additional Pocket Wizards to fire this flash from your camera. A minimum of 2 Pocket Wizards with a 1/8th-1/8th sync cable must be rented to wirelessly fire this flash without using the included sync cable. You may also fire this flash with the Profoto Air Remote TTL-C Transmitter for Canon or the Profoto Air Remote TTL-N Transmitter for Nikon, which is not included. • We make every attempt to recharge this flash’s (2) batteries but may not be able to 100%. Prepare accordingly. • This flash kit does not come with light stands. • There is no option for continuous power to the battery pack from the AC adapter. Once your battery is depleted, you need to put it on charge and swap with your spare battery to keep shooting. Extra batteries can be rented separately.